S.A.L.T.S. is ever restoring and repairing both their own, and now others' vessels. 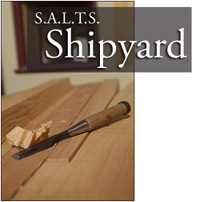 Take a peek inside their historic shipyard and see the works in progress. We will try to update this tour from time to time such that the current projects at the shipyard are shown. These Virtual tours are available in QuicktimeVR format. Select the tour to view from the list above. Once the image has loaded click anywhere within the image and drag your mouse pointer to make the image move in the direction you drag.